It was a cold winter day in 1973 when we drove down from Brussels, Belgium to an ecumenical gathering of Christian Groups in Mons, the headquarters of NATO. There we met a man from another world, Ramsahai Purohit, a follower of Gandhi who had just walked from India to Rome on a Peace March. In Rome he stood up before a crowd and proclaimed the need for peace and the evil of manufacture and storage of Nuclear Weapons. He was immediately arrested by the Italian authorities while he argued he was a world citizen and had every right to speak. Next day the Italian press published lots of photos of Ramsahai with the caption ‘ Gandhi comes to Italy’. A tense situation was saved by Pope Paul VI who rescued him from prison with an offer to stay at the Vatican. 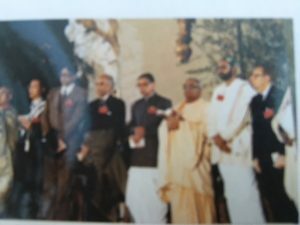 There he was warmly welcomed by the pope but Ramsahai was soon to be found on the steps of St Peter fasting for Religions of the world to accept the need for peace. He was firmly told he could fast but it must be inside St Peter’s. 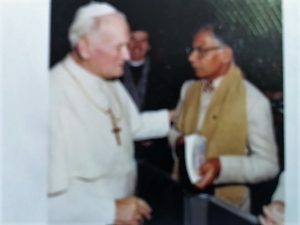 This was the start of a remarkable tour of Europe when Ramsahai met many of the European World leaders and became a lifelong friend of the Pope. In London he met with Harold Wilson and in Northern Ireland with Ian Paisley – the staunch leader of the Unionist party and in Northern Ireland he fasted for Peace in that troubled land. Ramsahai talked to the world leaders not only about banning the bomb but also of his dream to establish a large Peace Army that would be available to sit between warring factions and prevent further bloodshed. Ramsahai was determined to go to the United Nations and he persuaded someone to donate him an aeroplane ticket. On arrival at New York he found himself facing the immigration officer. ‘Where is your visa ?’ ‘I don’t have a visa’. ‘But where are you going to stay ?’. ‘With you my friend !’. Facing an astounded officer, Ramsahai produced a photo of himself with the Pope. Suddenly the face of the immigration officer lit up. He was an Italian immigrant. ‘You, a friend of the Pope, you must be an important man. Do come and stay with me !’. 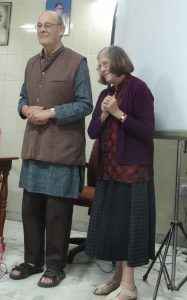 So started a remarkable friendship between Mary and Nicholas with Ramsahai – a seeker of peace and interfaith worker. In 1974 when Nicholas was working with the chemical company ICI, he got the extraordinary opportunity to go to Japan, and then Australia for a research project. This provided the chance to visit Ramsahai in his home. He was able to stop off at Delhi and then fly to Jaipur. Then a taxi dropped him off in the middle of Dudu – in the middle of the night !. Walking across the fields for 2 kilometres he eventually found Ramashai. A year later, Nicholas was back in Dudu – and sleeping on the rooftop. It was six o’clock in the morning and the sun had risen over the rooftops of the village. The village was awake – bells summoning people to prayer and women were collecting water from the well. Nicholas himself was awakened by a mother and baby goat nibbling at his feet! He was able to visit the Peace Home which Ramashai and his wife had founded: this was a community where families could live and work in harmony. Ramsahai ‘s wife and children still lived in the village awaiting the completion of the Peace Home. Ramsahai quickly took me there, awoke his poor wife, who immediately began to prepare a meal – lit the cow dung fire, ground the wheat and in half an hour the chapati were ready – as we drank hot sweet tea ( chai). 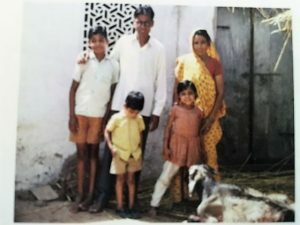 He found the idea of the Peace Home inspirational – as Ramashai and his wife tried to re-establish the simple agricultural community as a sound base for the economy. In his interfaith work, he travelled widely promoting peace. But it was not until the drought of 1987 that Nicholas and Ramsahai founded Wells for India. When wells dried up and 60 million animals died throughout India, this was a tragic situation that needed immediate response. 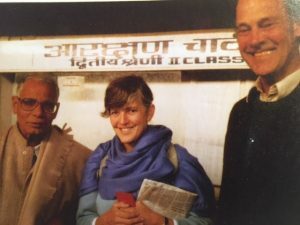 So Ramsahai resturected an old Gandhian NGO – Gram Seva Mandal Idankabas and Nicholas founded Wells in India to be a support and fundraising NGO. This was when we lived at Ryehurst Farm – a small pick-your-own- fruit farm – in Binfield, Berkshire and Nicholas was Chair of Churches Together in Wokingham where we also went to Church. 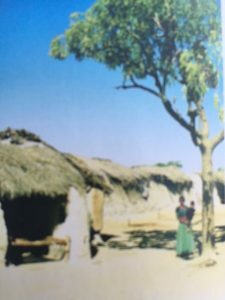 Local Churches in Wokingham now committed themselves to fundraise for digging wells and deepening existing ones in the Dudu block of Rajasthan. (The village – or small town of Dudu – is just over one hour’s journey from the city of Jaipur, Rajasthan’s capital). 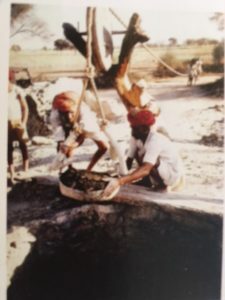 In the village of Ikankabas – where the organisation GSMI had begun – and in the neighbouring village of Gokulpura, together we established a revolving fund that enabled many farmers to dig for wells for irrigation. The miracle began to happened and the desert began to turn green overnight – or so it seemed! 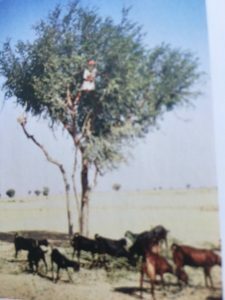 It was not until 1989 that Nicholas returned to Rajasthan and was horrified to see how far the drought had increased its grip on the region. Across North India tens of million cattle lay dead. In the Dudu block itself, not only had 75% of the cattle and bullocks died, but 100 out of the 200 villages of the block were without water. The wells had dried up. 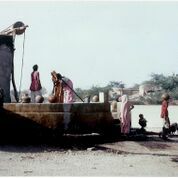 Women were rising before sunrise in order to make the journey to a well. Frequently they would lower a child to the bottom of a well to extract a few teacups of water while others searched for a pond. Some only found mud: they would soak their cloth in the mud and then squeeze the precious water into a pot. Readers may already be wondering as to the quality of the water found in this way! Clearly a crash programme was needed to deepen existing wells and build new ones. We badly needed technical expertise and measurements. Beneath the first few metres of soil in the Dudu block lay rock, so we needed to know whether there was water below, and where to find it. When we deepened wells, at what depth would we strike saline water, or water heavily contaminated with fluoride salts? Ramsahai and Nicholas travelled far and wide searching for help, travelling long journeys overnight by buses. ( Sleep was impossible for Nicholas : he could never settle as, being so tall, his head would swing backwards and forwards, well above the top of the headrest!). One night on the way from Ajmer to Udaipur, we did splash out to get a ‘deluxe’ ride: to the consternation of all would-be passengers, an ancient bus arrived. This ramshackle bus crawled along until it reached a bridge, which was blocked by one of the frequent road accidents. Off we detoured onto the desert tracks. Then came a request for the men to walk alongside the bus! A few miles later the bus came to a complete halt. We carried our luggage. At last we reached a main road and were lucky enough to be picked up by a lorry driver on his way to Udaipur where we arrived just in time for the 9 am meeting! This was our first meeting with AFPRO – Action for FOOD Production. To our great relief – and gratitude – their team agreed to undertake extensive searches for water – all free of charge. 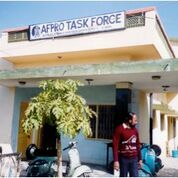 Over the years, this NGO, established in 1966 originally with Christian and Gandhian inspiration, has given us great technical assistance and advice. Not the least of this, is that it was while he was working as a civil engineer with AFPRO that we first met Om Prakash Sharma, who has now been our Indian Director for the last 16 years! Nicholas’s search for technical expertise would also take him to Delhi: it was on one of these early journeys that he first met Dr Anil Agarwal – cited at the beginning of this Prologue. But not only did he begin to understand the need to learn the ‘Ancient wisdom of the desert people’ but that our task would be made much easier if we became a registered charity: this was the advice given to us by Sir David Goodall, then British High Commissioner in Delhi. He convinced us that only then would we be able to get government support. This we did, in November, under the name of Third World Link, a sufficiently general name that would allow us, if we chose, to work beyond India. 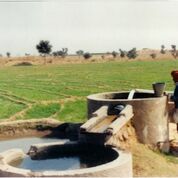 We still retained the name Wells for India in our general work. In the UK everyone liked the name: in India everyone wanted a well! So in spring and summer of 1989 things were hectic in the Dudu block, building and deepening wells in 80 villages. Somehow we managed to find the money. There were 20 villages where no water could be found: and there remained outlying hamlets without water. It would be several years before we got water to all these villages and hamlets. In January 1990 we both travelled to India !